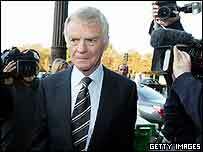 Max Mosley, President, International Automobile Federation. Stephen Sackur talks to the President of the FIA, Max Mosley. How much damage has been done to Formula One's credibility? After a season of dramatic finishes on the track and scandals off it, uncertainty still surrounds Formula One. McLaren has appealed against fuel irregularities by the BMW and Williams teams during the last grand prix in Brazil earlier this month. If upheld it could see Lewis Hamilton promoted to World Champion ahead of the current winner, Kimi Raikkonen. The sport's governing body, the International Automobile Federation also has to decide whether McLaren benefited from technical information obtained from arch-rival Ferrari - a decision which could see McLaren banned from the 2008 season.